The scientific world is an exciting and fascinating place filled with wonders and amazing discoveries. Sharing those intriguing discoveries doesn’t have to be dry and boring. With science poster templates from Lucidpress, you have access to professional designs that will help you relay information about science in an engaging, attractive and educational way. 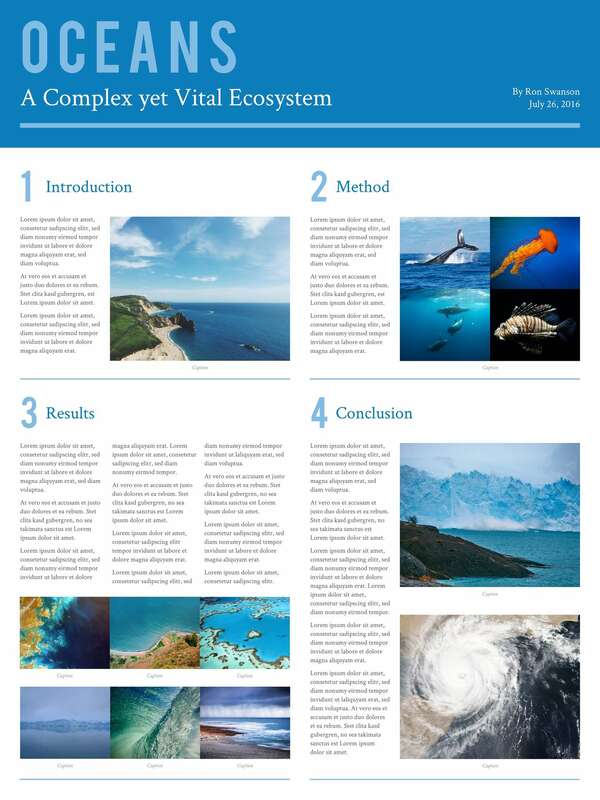 Explore the wonders of the earth, sky and sea with an imaginative scientific poster template. Creating your own posters has never been so simple. Our web-based editor uses intuitive drag-and-drop tools to design customized posters bursting with knowledge. You can upload your own photos, or use our handy search function to find the perfect images. Add text in a variety of fonts and shapes in any color you please. Our templates are designed to be high quality both online and in print, so you can share and display your creations with pride. Inspire a classroom, motivate an office, or decorate a bedroom with your own scientific research poster, made in minutes right here in Lucidpress. Lucidpress provides two unique templates for you to use for your scientific posters. What better way to show off the beauty of the outside world than with this Forest Research Poster template? This poster can serve as an inspiration to students in a classroom, or it can be a reminder to researchers of what they’re working for as they conduct research and experiments in the office or lab. 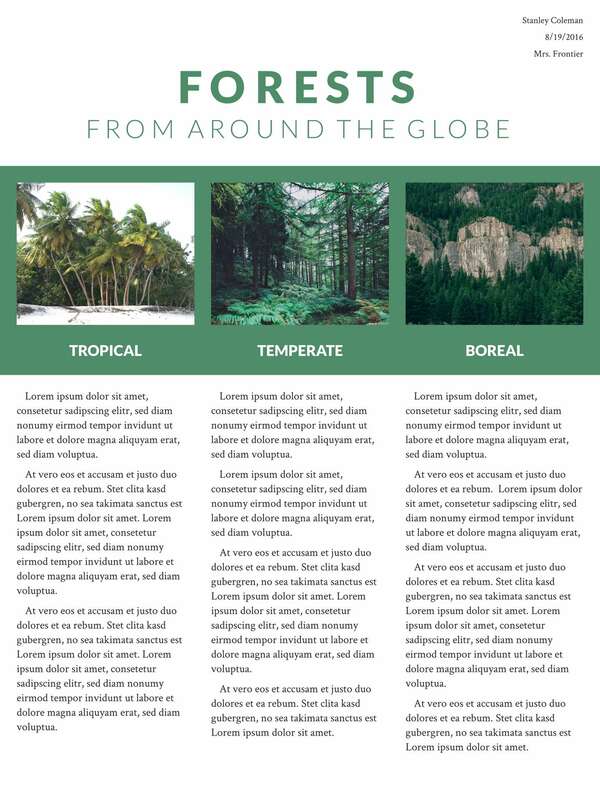 This poster template uses three columns to share information about outdoor scientific facts. Whether using it online or printing it online, the simple layout catches the eye and keeps readers’ attention so they can digest all this information. The template download isn’t limited to simply talking about forests. Use it for a variety of subjects. Just use the intuitive drag-and-drop tools to produce a vertical poster for school, work or home. Best of all, it only takes minutes for you to create something you can call your own. This large poster template captures the wonders of Earth’s ecosystems and condenses them into an easy-to-digest format. The size is optimized for poster printing but still works great for online use. Whether you’re looking to teach a class about the planet’s fascinating oceans or you’d like to show your co-workers how animal groups cooperate, this poster template allows you to use stunning images and your own fonts and colors to share the message. Even if you don’t have a poster presentation coming up, this template is effective in organizing information and presenting it in a clear and concise way. With only a few minutes of work, you can rekindle a greater appreciation for the natural world. You don’t have to be limited by those scientific poster examples. The templates only serve as a starting point for your creative talents. Customize each poster to your own specifications and preferences. You can keep it simple and just change the poster color, or you can completely change the layout however you want. It’s all up to you and your imaginative mind..